Lynn Fuston, head honcho over at 3D Audio, posits a compelling question. The answer is… well, read for yourself. It’s a bit of a lengthy thread but well worth the time. SPOILER ALERT: His solution involves and iPad and the AudioBox 1818VSL. "I ran a test last night. 16 tracks at 24/96. Recorded for a minute. Added another 16 in record for a minute while playing back the first 16. Then added 5 more stereo tracks. Hit record. Then added 6 more stereo tracks. Hit record. 1) This is not real world because we don't record 1 minute songs. 2) CPU usage at its highest never exceeded 30%. There are CPU and Disk Space Usage meters right on the front of the mixer. 3) I got "Low Memory" messages at least four times, so I finally quit every other app BUT Auria. That seemed to eliminate the problem. 4) It only bailed on a recording one time, and that was when I had the buffer set to 128. I upped it to 256 and it seemed fine. By then I was playing back 42 tracks at 24/96 and recording 12 more. I considered doing a stress test and recording for a long duration but file management using iTunes, at least to someone accustomed to using a computer, seems like a real headache. I'm going to wait to do that test until after I finish my actual music recording. I don't want to fill up the drive with huge empty files. Like the guy at the Apple store told me, "the iPad is designed for GATHERING information." Fascinating. In the big picture, I think he's right. It's a content-vacuum. Videos, pictures, audio: it's designed to collect info. It's really easy to import stuff into an iPad. Exporting (apart from tossing it into iTunes), not so much. So far, it seems like the recording will be the easy part. At least to this seasoned pro who is accustomed to using multiple backup drives and backup utilities like SyncPro and drag and drop file management." Apple fanboy Rick Naqvi should probably be hitting up Tim Cook for a sales commission. Here, he extolls the virtues of the iPad and Mac Mini… but it doesn’t end there. 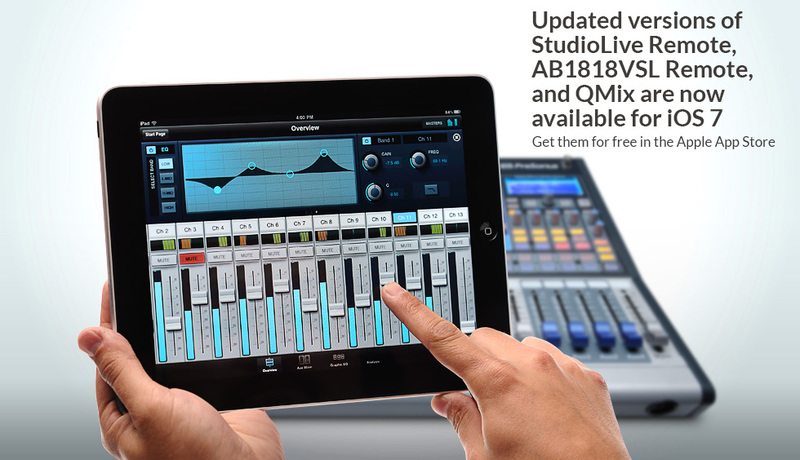 This isn’t just another “Wireless control of the StudioLive via iPad” video. This is something else. This has bells and whistles. First, Rick sets up his Mac Mini to auto-launch VSL on boot. So, assuming proper connections and having everything powered up, his Mac Mini will auto-connect to his StudioLive seconds within powering up. But keep watching… it gets real interesting. Via the iPad, Rick uses VNC Mocha Lite to connect to his Mac Mini desktop: no monitor required! This configuration allows you to run and interface with both VSL Remote and also access Capture or Angry Birds during the show. Rick keeps it simple and thorough at the same time—but you might wanna make sure you know what an IP address is before viewing.